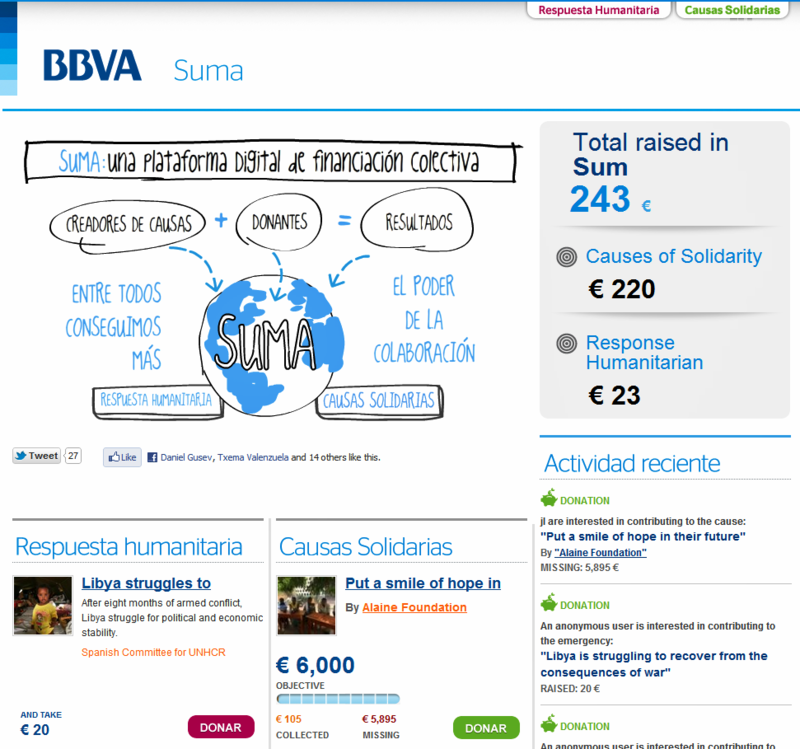 A couple of days ago, my good friend Jose Antonio Gallego – Social Media Manager at BBVA in Spain (and one of our ‘Visible Banking Stars’) informed me of the official launch of the bank’s latest initiative in the social media space ‘BBVA Suma‘ (or BBVA ‘Sum’ in English), a crowdfunding platform for non-profits. This is the second crowdfunding initiative from BBVA, following on its ‘BBVA Friends & Family’ launched back in June 2011. Spanish financial institutions, and in particular the Cajas, have a legal obligation to invest in social projects. Caja Navarra, arguably the most transparent bank in the world, have been a champion of local communities in Spain and international NGOs and non-profits for years. They have done a good job leveraging social media with among other initiatives an engaged blog network and a P2P lending / crowdfunding service introduced a couple of years ago. Two other remarkable initiatives supporting good cause, but not focused on crowdfunding, come from the US with Chase and its popular Community Giving programme on facebook, and Plan Big from Bendigo and Adelaide Bank in Australia. So one might wonder how innovative BBVA’s new crowdfunding service is, and how big its potential for success is? BBVA sum comes from the need to fund both large NGOs working internationally in humanitarian emergencies (Humanitarian Response), and local organizations with smaller projects (Causes of Solidarity). This is a collective funding platform where users can donate at least 3 clicks to the cause you choose as you please. The navigation is simple. In “Humanitarian Response” are located emergencies that are active through an index and a map are marked. In “Causes solidarity” provides a list of projects receiving grants, which can also be accessed through the browser. Furthermore, in each case and there are emergency buttons for Facebook and Twitter users to share their networks the social project that have helped and, together, begin to add up. It is always satisfying to see a leading global financial institution launching of a new platform tapping into social media, digital engagement, and the power of the crowd. Once more, BBVA decided to launch their own platform, instead of facilitating crowdfunding on other already established and trusted communities like facebook. The first hurdle of any new community or crowdsourcing platform is increasing brand awareness and driving recruitment. Then comes the challenge of driving engagement and activity. And all of that with a solid long-term strategy and a smart social media strategy which proves critical in creating word of mouth and giving visibility to the good causes. Back in June 2011, I shared my thoughts on the launch of their ‘BBVA Friends & Family‘ service which was facing the same challenges. Based on the (lack of) recent activity, the last actions dates from 18 March, 8 March and 27 February, I wonder how much momentum the bank managed to build in the last 8 months… and their social media presence never really took off (the facebook page seems to be offline and their twitter account counts just over 150 followers). I am hoping that they have focused more on this social media integration for ‘BBVA Suma’ which is ontwitter and facebook. I strongly believe not putting in place a strong social media strategy to support their initiative was a mistake. But it is not too late to fully leverage communities like facebook or twitter, and as a matter of fact I identified many quick wins and I have a lot of actionable recommendations to share with the BBVA team. So far, just days after its official launch, 243 euros were raised via the platform. I wish Jose Antonio and his colleagues all the best. It is important to give visibility to those projects all over the world, and urge people to contribute even if only by giving a few euros. The big question is why would people use their platform instead of traditionnal channels or more well-known sites and organizations? As a BBVA customer I would consider using it if it was very easy to use, totally secure, and if somehow those projects appealed to me more or were presented in a more personal way. In your opinion, how successful could BBVA be with this initiative? Would you consider using it? And as a non-customer, would those crowdfunding initiatives change your perception of BBVA and increase your propensity to consider them as a better, more decent, financial partner than your current bank?